My Krisel crush is well-known, and it's been happily fed recently, first by the sneak preview of Jake Gorst's upcoming documentary "William Krisel, Architect". I cannot wait to see the full version. A short time ago Krisel Keeper left a comment here. I followed the links and found her blog detailing the ongoing rehab of a Krisel ranch in Woodland Hills, California. Then there was the trip to Palm Springs, which is dotted with Krisel houses. It was like eating a box of chocolates all in one sitting, albeit really, really good Belgian chocolates while lounging in an Eames chair. 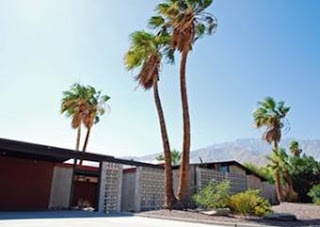 I toured three Palm Springs neighborhoods, Las Palmas Estates tucked under the mountains, Racquet Club Estates and Twin Palms in search of the Alexander Construction Company homes designed by William Krisel of Palmer & Krisel. And as I don't have any Belgian chocs to give you, I'll share my real estate finds: three gorgeous examples recently on the market with links to more photos and to the realtors. Enjoy! 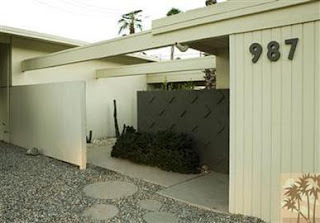 The earliest of the Krisel modernist tract homes, like this 1600 sq' 3 bed, 2 bath Alexander Sunflap in Twin Palms Estates, were built in the mid-fifties. Complete with mountain views a Krisel designed home in Las Palmas Estates, just a stroll from downtown Palm Springs. LOVE it! Notice the Kabel Bold address numbers? I DID notice the numbers! Such great design and a terrific architecture lesson. All the best restored examples had huge Neutra numerals, it's like an "I get it" sign outside the houses. But did you notice anything familiar about the screen shot of the first video? Tracy, thanks for dropping by again, hopefully the documentary will shown next Spring. BTW, that's my den William Krisel's son is sitting in on the screenshot. Just came across this post and thought I'd say hi and thanks for posting about the upcoming Krisel documentary, which is due to premier at the Palm Springs Modernism show in February. We'll be there (our house is the last one shown at the end of the trailer - both interior and exterior shots). Thanks for commenting Darren - we are hoping to be in PS to catch the premiere. BTW I LOVE your renovation!